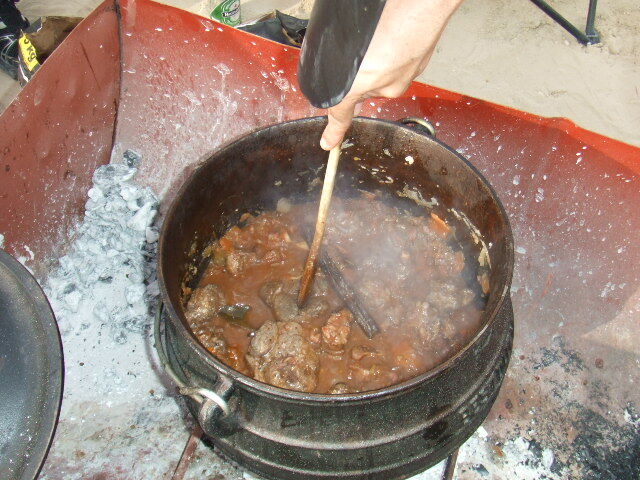 Parow Oxtail Shankie Potjie | What a Potjie! 	Brown the meat well (colour =flavour) and also seals in all the meat flavour – about 15 min per batch of meat. 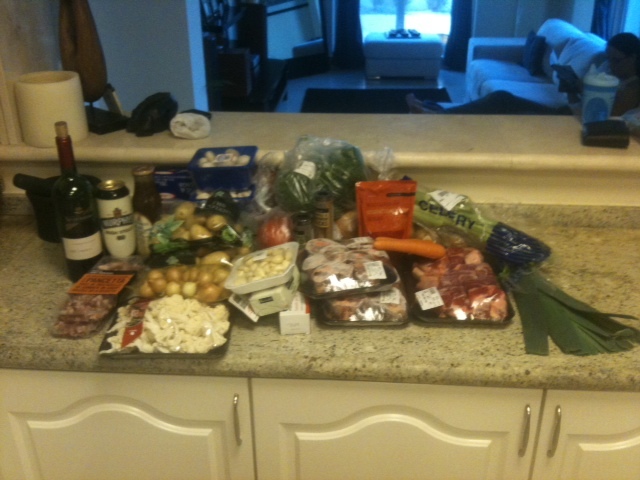 Do oxtail – remove and drain and then brown the shanks and remove. 	Add onion (2 x Large Onions), carrots (2 large carrots finely diced), celery (2 sticks celery), 1 x Leek. Let it soften then add 4 cloves minced garlic, peppercorns (10), cloves (10)– brown the garlic about 3 min. 	Now pack the veggies as follows – A ring of green beans against the edge of the pot, then a ring of carrots and a ring of cauliflower right in the middle. 	Push the mushrooms tightly between the edge of the pot and the green beans and sprinkle the chilli over. 	Pack the potatoes (keep them whole) between the beans and the carrots and sprinkle the chilli over. 	Pack the uitjies around the cauliflower and sprinkle the soup powder over. 	Cover with the lid and allow it to simmer for a further 1.5 hours or until the veggies are soft. 	If needed leave top off and increase heat of fire to thicken sauce. 	No salt is used as the soup powder and beef stock contains enough salt.